There are numerous options in the Lake District which provides a beautiful backdrop for your adventures. The city of Bariloche is cradled within the Andes Mountains and has an endless number of outdoorsy options as you will see the second you step into town. 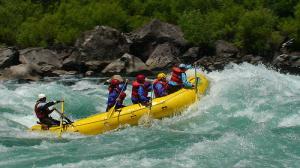 Rafting fits right into that category and there are multiple rafting guides to choose from. 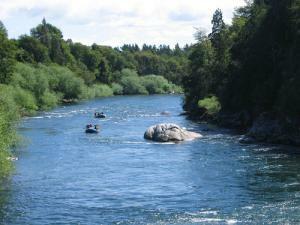 The easiest of the river runs is Rio Limay. The river is class I and great for families with small children. Rio Manso is within this same area and provides a couple of different river opportunities. The lower Rio Manso is a class II run that takes you up to the border of the Nahuel Huapi National Park. But if you are looking for a more white water, then go for Rio Manso to the border of Chile. This is a class IV river run that guarantees excitement and spectacular views as you weave your way down the river and head toward the Chilean border. Just up the highway you will find the enchanting town of San Martin de los Andes and just outside of it – Rio Hua Hum. This class III course can be arranged through one of the various tour agencies in town and allows you to select among three options of how to arrive to Hua-Hum. If you are hesitant to go for the big class IV along the Rio Manso, but you think that the class II runs are a little slower pace than you’d like, maybe you should head to Travelin. Outside of Travelin there are at least two outdoor adventure travel agencies that can book you on an incredible white water run down Rio Corcovado. This run falls into the class III category. El Bolson, a small pueblo south of Bariloche that offers a more than a chill environment and hippy market, is another small Patagonian town that has class II guided rafting trips. The tours go down the pristine Rio Azul.